The New York City mayoral race is heating up with several candidates in each of the Democratic and Republican primaries, as well as several potential independents. With the primaries this September and the general election in November, voters have a few months to get to know the various candidates. Campaigns have reached out to seek student interns, and after a recent request, I was moved to write back with a few questions. Given the local concern over these issues, perhaps some general phrasing of these questions for all of the candidates might serve to inform voters of how New York may move forward on issues of the environment, social equity, and the economy. While candidates mention expanding recycling services, we have not heard discussions about composting food or biodegradable packaging, materials which are significant contributors to the solid waste stream. Large-scale composting would allow businesses to distribute biodegradable packaging that would otherwise sit in landfills. What specific steps do the candidates propose to expand composting? What timetable can New Yorkers expect for these composting services? Finally, it is encouraging that the CitiBike program is beginning this spring, and that New York City has a wide network of bicycle lanes. These developments are crucial elements of the PlaNYC platform on transportation. (Link opens a PDF.) That said, rare are the lanes that are not regularly abused by trucks and automobiles double-parking. What steps do the candidates propose to enforce and protect the existing bike lanes? This entry was posted in policy on April 30, 2013 by Carl Zimring. Last night, Jeremy Irons presented a new documentary he’s narrated at the Brooklyn Academy of Music’s theatre. 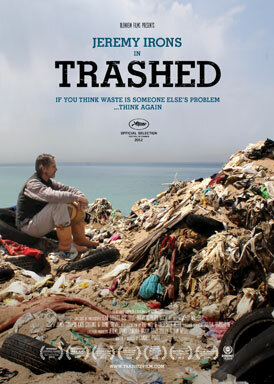 Trashed is a global look at how our use of the waste stream — and especially plastics — has affected the land, air, and water. For scholars of waste, the film isn’t a huge revelation. Indeed, the summary I just gave sounds not all that far removed from the thesis of Joel Tarr’s 1996 book The Search for the Ultimate Sink. And we may quibble about various points in the film, from a simple look at recycling to a lack of discussion of cradle to cradle design solutions to minimize waste. The film has limited screenings, but anyone reading this post can see the film. It begins streaming over the net today. Click the link at the previous sentence to watch. Today is Earth Day. Historian Adam Rome has a new book out about the history of Earth Day, characterizing it as an event that galvanized a disparate group of people with shared concerns, if not up to that point shared organization. A result was a more coherent environmental movement in 1970. In the United States, we have seen limits to action created by that organization (and a retrogressive pushback that has unfortunately transformed the Republican Party from an active agent in environmental protection to a force bent on endangering American citizens and ecosystems to the benefit of few). Sharing Trashed with casual fans of Jeremy Irons or Vangelis, or to friends and neighbors, is an excellent way to continue the inclusive spirit of Earth Day. Discussing our present concerns, future challenges, and future opportunities is utterly in keeping with the conversations women’s groups, college students, workers, scientists, suburbanites, Gaylord Nelson and all those who gathered 43 years ago did on the first Earth Day. This entry was posted in recycling, waste on April 22, 2013 by Carl Zimring. I am also leading a team of Pratt Institute faculty teaching the third offering of SUST 201P The Sustainable Core. This course is designed as our introduction to Sustainability Studies, is an excellent way to get familiar with the many ways sustainability is practiced at Pratt, and will be required for students opting to minor in Sustainability Studies (an option that is coming soon — watch this blog for details). 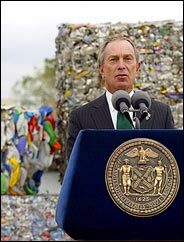 This entry was posted in consumption, recycling, students, teaching, waste on April 15, 2013 by Carl Zimring. I am also leading a team of Pratt Institute faculty teaching the third offering of SUST 201P The Sustainable Core. This course is designed as our introduction to sustainability and is an excellent way to get familiar with the many ways sustainability is practiced at Pratt. This entry was posted in consumption, recycling, students, teaching, waste on April 5, 2013 by Carl Zimring. I grew up with Roger Ebert. He was on TV, yes, but even as a kid, I read him more than I watched him. He was, from 1967 until his death this week, the film critic for the Chicago Sun-Times. We were a Sun-Times family, favoring the tabloid’s focus on what was going on in the city over the larger, more conservative Tribune’s coverage of the suburbs, the Board of Trade, and the hated, hated Cubs. The Sun-Times shaped my reading habits, starting with the comics, then the obituaries (placed near the comics and usually as short and repetitive, familiarizing me with words like “injuries,” “survived by,” and “visitation”), sports, entertainment, and the front page. My timing was good. In the five years between the damp March day in 1978 when the late great afternoon Daily News was folded into the Sun-Times and Rupert Murdoch gutting the paper in 1983, it was home to a large stable of accomplished journalists. Some, like Mike Royko, Irv Kupcinet, and Ann Landers, were local and national celebrities. Others, like Pam Zekman, Zay Smith, Art Petacque, Robert Feder, and Lloyd Sachs, might have less familiar names, but no less impressive work under publisher James Hoge. Zekman and Smith collaborated on a series of articles in which the Sun-Times created a bar (the aptly-named Mirage) to reveal local corruption in the regulation of taverns. Eight-year-old me read each installment, fascinated by new words like “shakedown” and “graft.” Visiting the front page after reading Bill Gleason and John Schulian lament the fortunes of my beloved White Sox was as much of my education as anything I learned in third grade. And every Friday, Roger Ebert published several movie reviews. By this point, Ebert had already won the Pulitzer Prize for criticism, but I was too young to realize or appreciate this honor. I just liked his writing, clear, descriptive, prolific, comprehensive. I appreciated it all the more when John Belushi (who with his partner Dan Aykroyd, made a big-budget love letter to Chicago called The Blues Brothers that opened the doors to Hollywood productions in my home town) died of a drug overdose in 1982. The Sun-Times had plenty of capable writers, but Ebert wrote the succinct yet by no means detached obituary that ran hours after the body was found. (And followed up on Belushi after Bob Woodward’s Wired came out two years later with a thoughtful essay that was a hallmark of his work.) That obituary made me appreciate how Ebert could write so many good reviews each week. He was prolific, he was fast, but he was also literate. He outlasted Murdoch, who sold the paper a couple years later in order to purchase WFLD-TV and a string of other stations nationwide that would form the Fox Network. In Murdoch’s place came Canadian media baron Conrad Black, who would eventually go to prison for his personal reallocation of company funds. Before Black’s conviction came some high-profile labor squabbles with the employees he robbed; despite Ebert being a wealthy celebrity, the critic sided with his fellow workers. Black criticized him, which was about as smart an idea as a drunk in a bar taking a swing at Mike Tyson. Black went to prison. Ebert stayed at the Sun-Times. By this point, he had already started his fight with cancer, initially undergoing surgery in 2002. Four years later, he nearly bled to death when his carotid artery (weakened by radiation) burst. Resulting surgery removed his jaw and speaking voice. But it did not silence him. Already a prolific blogger (in addition to reviewing hundreds of films each year), Ebert intensified his writing with longer essays on film, society, politics, and his personal history. Sometimes two or three long essays would come out in a week, joined by half a dozen film reviews. The volume was matched by the quality. As he approached his late sixties, Ebert was recognized by the International Academy of Digital Arts and Sciences with a Webby Award. The long form of his essays, including personal stories remembered with astonishingly acute recall for details, led to a memoir published in 2011. The work Ebert did after he lost his jaw is his finest writing, more than 40 years after he first joined the Sun-Times. Ebert stayed at the paper to the end, 46 years in total. He broke his hip last December, which turned out to be due to a recurrence of cancer. This finally slowed his writing down, but did not stop it. In his final month, he stayed engaged in the events of the world, writing about the election of the new pope and the economic interests preventing action on climate change. The political responses to this condition seem to fall along party lines. Democrats think legislation is needed Republicans don’t want the feds interfering with private enterprise. Vested interests weigh in. Pork barrel projects are protected by lawmakers on both sides of the aisle. Washington fiddles. Earth burns. I get stirred up more than many people, because I see so many documentaries. Yes, they’re “biased.” There’s much less motivation for an “unbiased” documentary. Docs are usually made by people who have something they think you should know. There is little motivation for objectivity, something people forget when yet another doc comes along. And there are so many causes! Genetically modified crops! Chemical fertilizers! Trademarked genomes! The downside to wind power! An explosive-blowing doc like Chasing Ice comes along, and hardly causes a stir. “Consider.” Not the most electrifying word I can imagine. Yet consider the response. I read on: “It’s got us very freaked out,” said Ross Eisenberg, vice president of the National Association of Manufacturers, a Washington-based group that represents 11,000 companies such as Exxon Mobil Corp. and Southern Co. The standards, which constitute guidance for agencies and not new regulations, are set to be issued in the coming weeks, according to lawyers briefed by administration officials. “Freaked out.” You know what has me freaked out? I consider it a real possibility that millions now living will die as a result of the interests of the National Association of Manufacturers and its 11,000 members…. This time the line has not been drawn on a map. This time the enemy, if we can use the word in this context, is an American lobbyist group. They seem focused on maximizing profits and shareholder benefits, at the cost of any environmental conscience. It seems possible that their policies will lead to a different kind of seasonal calendar. Instead of Winter, Spring, Summer and Fall, this new generation will know Blizzard, Flood, Heat and Fire. Month follows month as the seasons tear themselves apart…. Today, the Sun-Times is a skeleton of its former self, having had several rounds of layoffs and buyouts after Conrad Black raided its accounts and the 2008 economic collapse. The economic shocks of the transition to digital media have hurt many papers, and the Sun-Times is no exception. 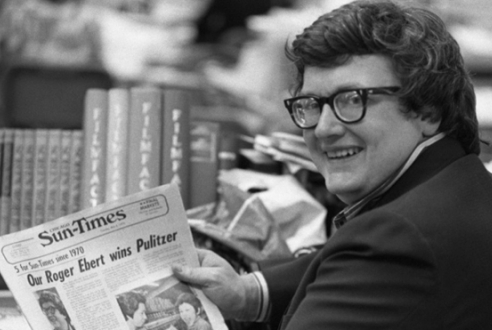 At the time of his death, Roger Ebert was the last great link to the paper’s 1970s prominence under Hoge and its brightest internet presence (measured both in terms of his popularity and his quality). Roger Ebert was an old-school journalist, prolific and literary, yet unpretentious and accessible. In this way he reminded me of another legendary Chicagoan, Studs Terkel. As he got older, he became more prolific, and embraced new media to reach more and different people. In the near future, his massive archive of writings will be reorganized for accessibility, but no new essays will arrive. I will miss that. We were lucky to have him as long as we did. This entry was posted in history on April 5, 2013 by Carl Zimring.